Electronic version of our popular full color book. Fact sheets, action plan work sheets and projects can be printed from your computer and put into a binder. 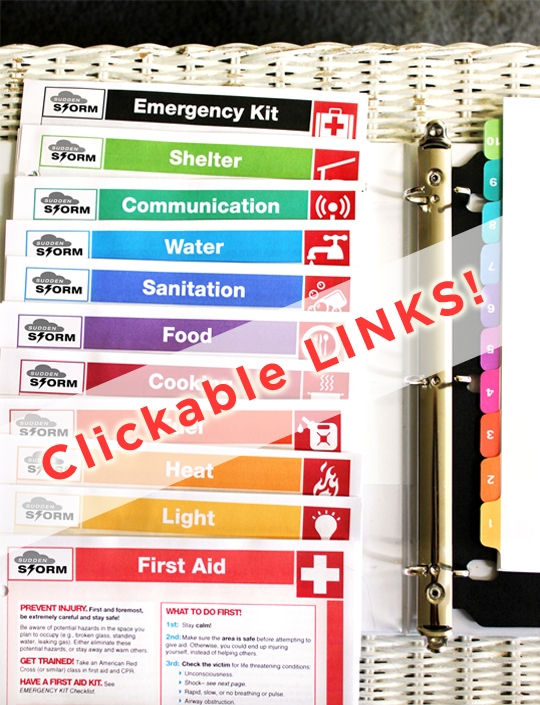 In addition to containing your unique emergency action plan, this binder can be further customized to meet your own personal needs: for example, by also including a home fire escape plan, recent photos of loved ones, and copies of important papers. Bonus! Embedded links can be clicked right in the document to go to web pages. For more information, see the Product Description below. EMERGENCIES, from accidents to natural disasters, can happen anywhere, anytime. Sudden Storm is packed with the information you need to be proactive instead of reactive—an inspired, empowered, self-reliant problem-solver with the knowledge, tools, and resources you need to handle an emergency situation. With detailed instructions and tips, informative illustrations, and an authoritative and approachable style based on extensive research and credible sources, Sudden Storm takes the guesswork out of emergency preparedness. Clear and concise, it provides the essential facts on the most important safety topics including: shelter, communication, water, sanitation, food, cooking, fuel, heat, light, and first aid.